EDIT : 3.9.14 : HUGE THANKS TO EVERYONE THAT SUBMITTED LINKS TO THIS EXHIBITION! WE'LL BE RELEASING THE LIST OF PARTICIPATING ARTISTS EARLY THIS WEEK! WE'LL KEEP YOU POSTED! :) THANKS FOR THE AWESOME TURN-OUT! 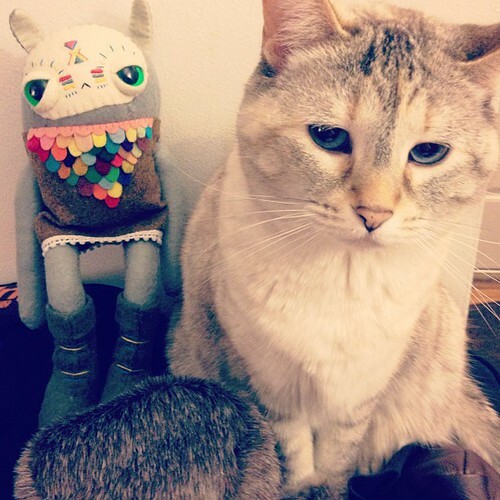 <3 *************************** How to find your SPIRIT ANIMAL. Ah, so you see, there is actually a mystical method for finding your Spirit Animal. It doesn't require you do fast, or to ingest any herbs, or go on a journey out into the wilderness. This one allows you to channel your spirit animal through easier, more comfortable means. This wise method was taught to me by my incredibly wonderful Comic 2 teacher, Peter Gross, and now I will pass this wisdom down to you. First, find a quiet space and get comfortable. Close your eyes. Focus on your breath. Breathe in and out slowly until you get comfortable and you're able to be still... Now, with your eyes closed, focus on trying to see the color red.... really SEEING it. It'll be tough at first, but hold out until you really can see red while your eyes are closed. Hover there for a moment. Keep breathing. When you come to the end of the spectrum (sometimes this process takes a half hour, sometimes ten minutes...) keep you eyes closed. Envision yourself standing on the edge of a body of water. (What kind of water is it?) Ready yourself and then, once you are ready, jump into the water. Allow yourself to spend a moment under water until you are ready to surface. Surface slowly... When you surface, look around you. Where are you now? What can you see? All with your eyes closed, what is in front of you? If you can't see anything, begin exploring your surroundings. Many people re-surface in a different place than when they jumped in the water... Look around for any signs of life....Take notice of the first creature you see. Remember it's size, shape, color and demeanor. This is your spirit animal. 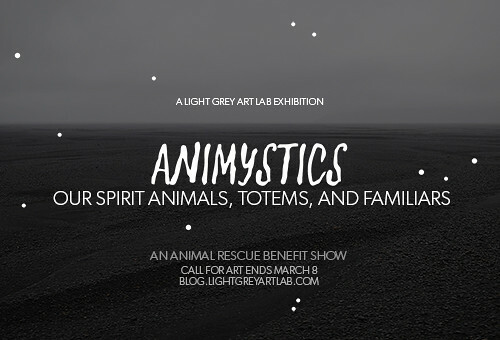 We are looking for animal lovers of all types for this exhibition... We are building a catalog of totems, patron saints (of sorts), familiars and spirit animals. This show combines a bit of historical, cultural and mystical research with some of our favorite furry (and not so furry) creatures. We need artists that want to find their own spirit animals, and help us write their histories, characteristics, helpful (or hilarious) abilities, and our connection to them. We're looking for artists that would like to name, describe, illustrate their spirit animal in a way that encompasses it's true calling, special abilities, healing, protective features, or anything else. This can be as mystical, serious or personal as you'd like. The final works can be traditional or digital medium and we will be showcasing a variety of prints and originals for the exhibition. A small plaque will accompany all of them in the gallery that helps tell the story of each spirit animal. More information on this will be provided to the participating artists. Also! During the month of April we'll be showcasing all of these spirit animals by building an interactive quiz so viewers can find their own spirit animals through the collection based on their decisions! We will be choosing an animal rescue to sponsor for this event, and a portion of the proceeds from any sales of the work will be donated to help our furry friends! More information on that to come! We'll also be doing all sorts of fun animal related podcasts, meet-ups, and more during the month of April as an homage to our funny pets, companions and creatures that we love dearly. 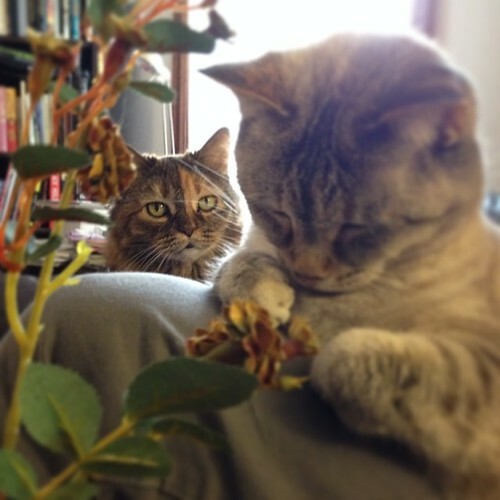 Miles, patron saint of creeping. We will be jurying the show and should be able to announce the final artists by Monday March 10th! If you have any questions about the parameters, the deadlines or the project, please let us know! All details, deadlines and specifics will be sent out via email to our final list of artists on this date! Keep an eye out for another call for art (or two) very... very... soon.